From Claire Brittenden, 17 April 2006: Looking for more info on the Millers of Monk Castle, also I think they were associated with Dumfies Castle. Also would like to be able to see a picture of Monk Castle. From David McClure: See Ayrshire & Arran: an illustrated historical guide by Rob Close (RIAS, 1992), 89 (information but no photograph). From Julie Spielman, 7 September 2006: Below is a summary of the Miller family, who resided at Monk Castle from 1723 until at least the mid-1850’s. 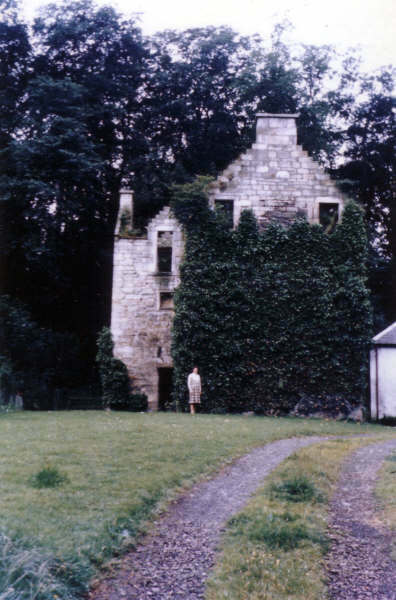 I have also attached two photos, taken by a family member in 1964, which from the information written on the back of the photos are of the original Monk Castle and of “Monk House”, the family residence constructed in 1820. This building is not listed in the Inventory of William Campbell Miller, but may be under another name. 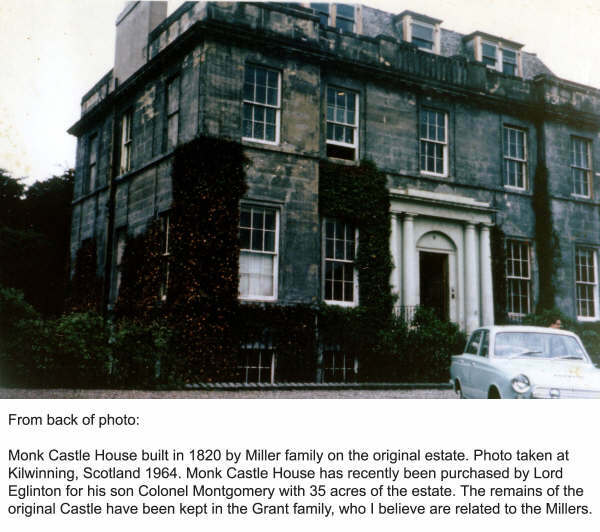 I would be very interested to learn more of the history of Monk Castle and the Miller Family, and would be happy to provide more details from my own research to others. William Miller in 1846, the estate passed to his youngest son, William Campbell Miller. William Campbell died intestate at the age of fifteen in 1857. Baidlandhill and Windyedge in the parish of Dalry. Crofthead, Heatterhill, Bannock and Monkridden House.